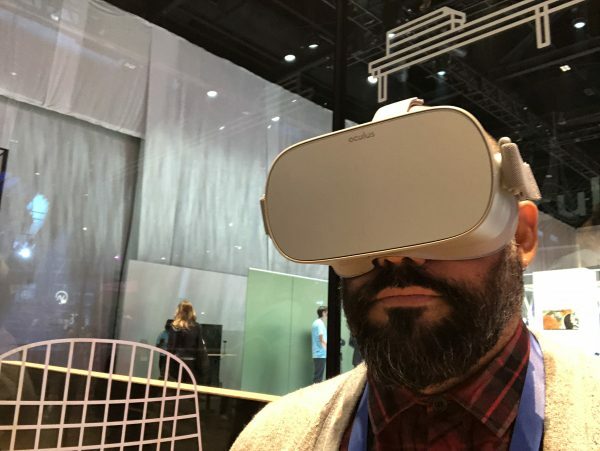 Like many of you, I’ve eagerly been waiting to get my hands on the Oculus GO, the first stand-alone headset that includes everything from the screen to the audio. It’s the main reason why I am attending my first F8 conference. In the last few months I’ve done demos and events that required me to either drag around my laptop/Rift setupA camera position for a given scene. You might shoot more than one shot from a single set-up (wide shot and close-up). or use my Samsung phones, that would overheat or lag in playback. I usually skip putting on the headphones, simply giving up on what is known as the backbone of storytelling and arguably the most important element to truly feel immersed. 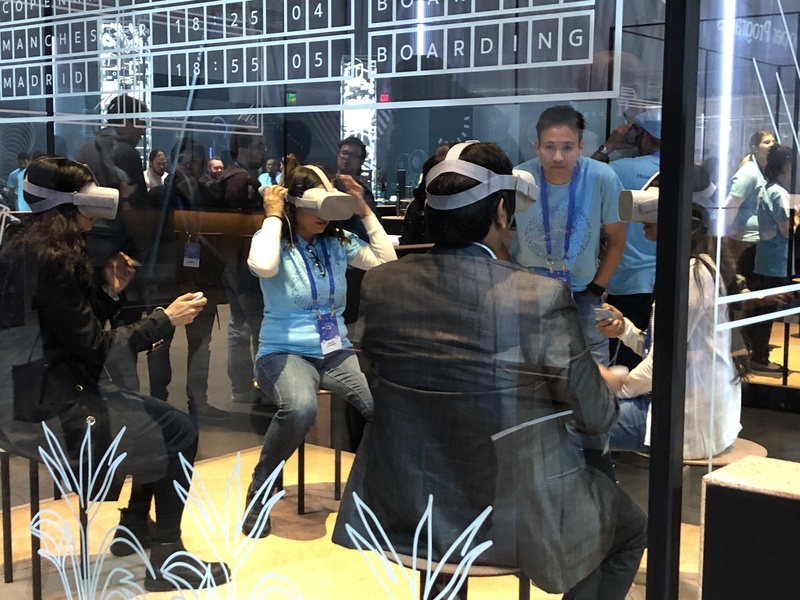 After Mark Zuckerberg’s keynote and the final words on Head of Oculus Hugo Barra, I immediately rushed to the demos and went straight for the GO. When they say it is comfortable, they mean it. The head-mounted display was light and comfortable with the straps hugging my head. You tightened the fit like the Rift, by pulling Velcro tabs on both sides. During his talk, Barra demoed how quickly it is to get into VR by simply putting the device on, and that’s true too. Once I put it on I was in the main are ready to select my experiences. Both speed and comfort come into play with the handheld controller. It feels natural and the tracking works fantastically well. I was sitting during the demo and had the controller on my lap. Good news: You don’t have to stick your arm out in front of the device for it to keep track of the controller. The controller was read by the headset and was responsive to button pressing and even with my subtle wrist movements. I tried Felix & Paul’s Jurassic World: Blue and Coatsink Software’s game They Suspect Nothing! In the game, after selecting my robot body, you nodded your head to interact and give answer questions, the headset was responsive too. No lag. As you can imagine, there was a flow of hundreds of nerds excitedly walking into the demo floor – it was loud. I could still hear the audio in the device, although it was nearly drowned out by the crowd noiseUndesirable variations of brightness and/or color in an image that typically occur when recording at high ISOs in digita... More. But it was much louder by simply cupping my hand over an ear. I don’t know how they do it, but the audio straps work great! Problem solved. One negative is that there is still a nose gap where light comes in. I moved the HMD around but never sealed it completely. Another possible issue is that the volume button and the power button are too close to each other and that might lead to some annoyances when demoing to newbies. I didn’t try to social experiences yet, but that’s my goal for Day 2 of the conference. The device comes in two levels: 32GB version costs $199 and the 64GB version, $249. Learn more about the specs here. This device solves so many problems for us storytellers traveling with HMDs to showcase our work. And it is so easy to use that this does genuinely feel like a leap forward to accessibility and mass adoption. 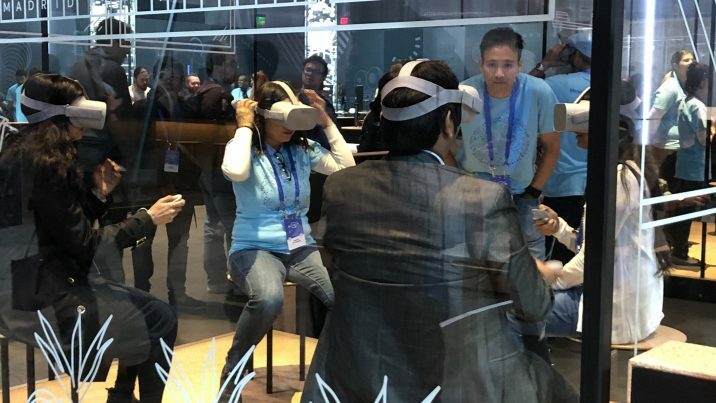 As one of the themes at F8 says, this may be the year for VR to go mainstream. Maybe. Maybe not. It certainly is a big step. If you want a one line takeway about my thoughts: Even though I am getting one for free at the conference, I already order five for my work. Yes, five.